A happy foursome. 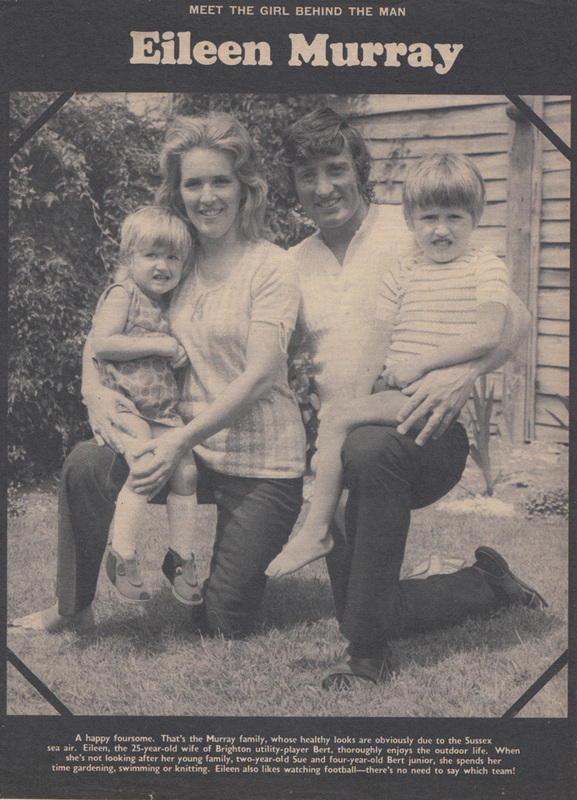 That’s the Murray family, whose healthy looks are obviously due to the Sussex sea air, the 25-year-old wife of Brighton utility player Bert, thoroughly enjoying the outdoor life. When she’s not looking after her young family, two-year-old Sue and four-year-old Bert junior, she spends her time gardening, swimming or knitting. Eileen also likes watching football – there’s no need to say which team! According to the book Seagulls! by Tim Carder and Roger Harris, the two top fundraising schools even contested the Pat Saward Cup at the Goldstone at Easter. And now, from Football League Review in April 1971, some background on manager Pat Saward’s grand visions. Incredible to hear a professional football manager talking about autograph collecting competitions, fishing contests and international bowling competitions! When Bert Murray moved from Birmingham City to Brighton last month, he became football’s number one fans’ player - the first signing to be completed with the help of a unique scheme introduced by the Third Division club, a buy-a-player fund. It has given Brighton’s supporters a special interest in the new player at the Goldstone Ground. He’s their player and to prove it they wear ‘I bought Bert’ badges. But the buy-a-player appeal is only part of an ambitious scheme launched by the club five months ago to raise money and involve the Brighton public in the affairs of their League club. Saward has little sympathy for clubs who continually moan about their financial plight and do little about it. “Too many people spend too much time shouting about how hard up their club is, and too little time fighting to improve the situation”, he says. “You never get success if you sit around. You must have courage, even audacity and work hard for survival”. Already Brighton’s appeal fund has raised £1,000 from a sponsored walk and held numerous big-prize draws. Future projects include an international bowling competition, a fishing contest and a variety night when the Pat Saward appeal fund take over the first night of the summer show on Brighton’s Palace Pier. “It is like a motor car”, says Mr. Saward. “It will quicken up as it goes along. Each project will be bigger and more ambitious”. At monthly meetings, those who have donated to the appeal fund are invited to talk to the Brighton manager, discuss club policy and meet officials and players. “The whole business is aimed at involving the supporters with the club, building up a club-supporter relationship”, says the manager. “But I must stress the support we have had from the club’s directors who have sanctioned everything the appeal fund have asked for. “Subject to their approval, we hope that when the appeal fund reaches £15,000, a member of the committee will join the club board”. The appeal fund’s committee meet weekly to discuss future projects and money-making ideas, “They are eminent people in the town with enthusiasm and concern for the club”, says the Brighton boss. Pat Saward bubbles with enthusiasm when he talks about the overall project. “When we stage the variety night, we hope to produce a brochure which will certain a competition to find the top autograph hunter in the area. “The brochure will include 12 pictures of some of the game’s leading players with room for their autographs. The first person to submit the sheet filled in with the pleyers’ signatures will earn that top collector title and to ensure there are no forgeries, I will have the authentic signatures to check with”. 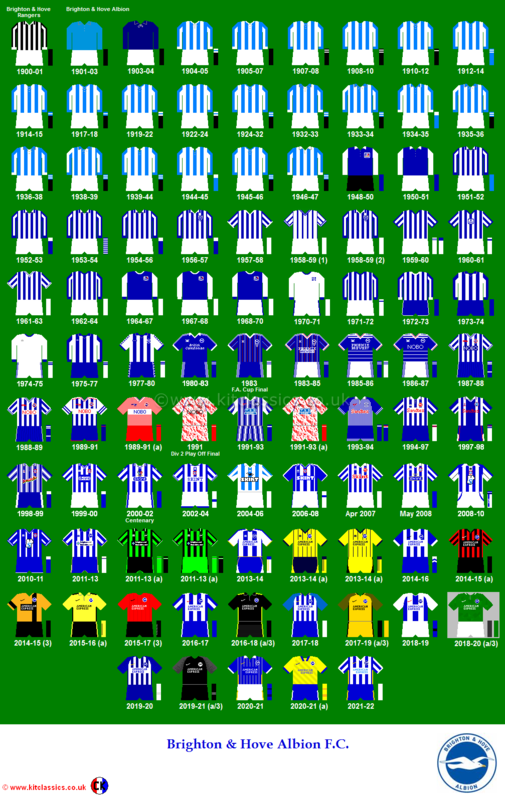 Manager Saward believes that other clubs could and should follow Brighton’s example to boost interest in their club and raise funds. “We are perhaps fortunate in our location”, he admits, “it would not be so easy if we were situated in an area near to a First Division club. Here there is tremendous potential, but you must have the backing of a progressive board to succeed”. Those I bought Bert badges are only the start of a ‘back Brighton’ campaign. “Once you have got the initial impetus, who knows how far you can go…” says the manager whose ambition matches his enthusiasm. 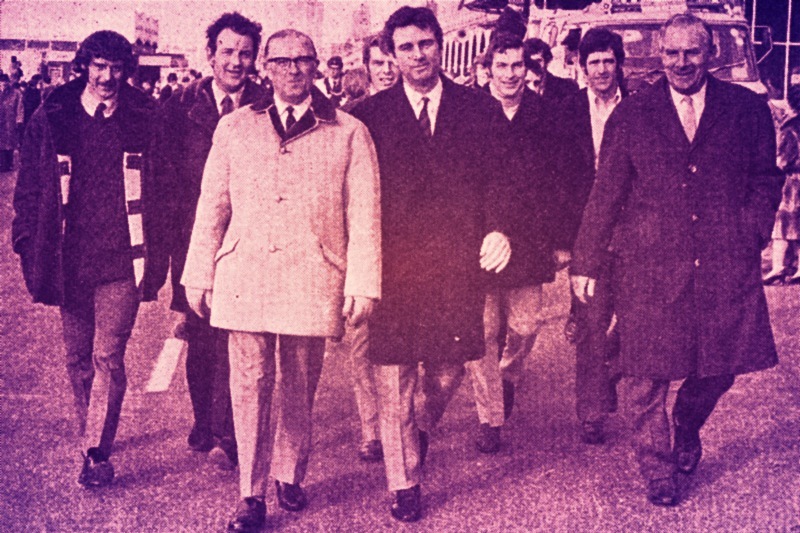 Club officials and players lead the sponsored walk: Kit napier, Terry Williams, Mr Tom Whiting (Chairman), Peter Dinsdale, Pat Saward (Manager), Norman Gall, Alex Sheridan, Mr Len Stringer (Director).